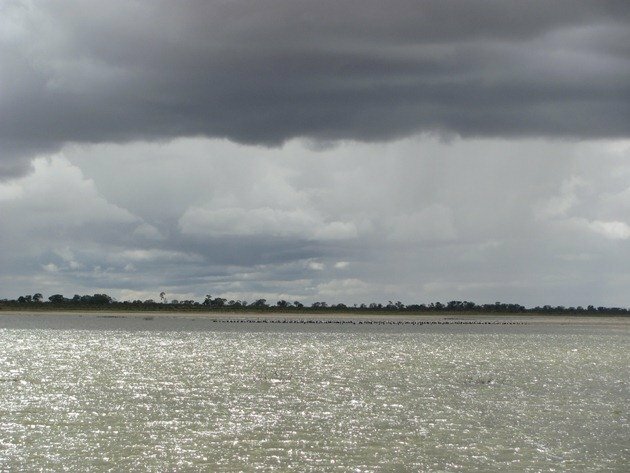 On our recent trip to Queensland we travelled inland to avoid the rain on the coast. We collected information on National Parks and there were several that we had not previously heard of. One of these was Lake Bindegolly National Park, which is located about 1000kms-620 miles from the coast. 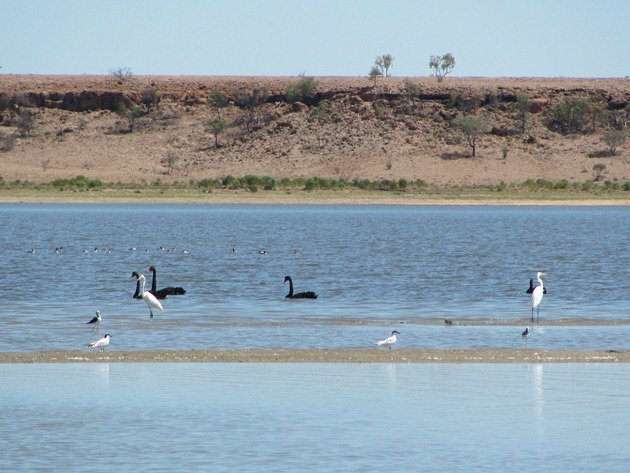 Most people have heard of Lake Eyre, which is well-known for the variety of bird life on years that it floods. It is also the place where Donald Campbell famously tried to attempt a land speed record with the Bluebird-Proteus CN7 in the 1960’s. It appeared that Lake Bindegolly National Park could also offer us the same birding opportunities if there was water present. It appeared that it dried out every 10 years or so, but we were having problems finding out if there was any water in it this year. By the time we had reached Eulo, with a population stated as 50 people and 1500 lizards we were within an hour of the lake system and we would just go and look anyway. The Pub/Hotel/Camp site…all one and the same in this small town, looked like the place to ask about the water situation at Lake Bindegolly, but we still couldn’t find out. By chance, as we watched the Blue Bonnets on the power line from the back of the Pub after we had set our tent up, there were three birders that had just returned from Currawinya National Park to the south. They confirmed there was water in the lake system, so we planned to head out the following morning. The National Park is unusual because it offers very few facilities compared to most, but there is a sealed road right into the small car park and a shade shelter with a table and chairs and information about the park. All access is on foot and the trail is about 9kms-5.5 miles long. On the first day we visited the temperatures were close to 40c-104f and extremely dry. We carried ample water and spent 4 hours walking and birding. The first birds we came across were Orange Chats, but they moved as a flock of up to two dozen through the bush and were not keen to be photographed. As we wandered along the trail we soon encountered family groups of both White-winged Fairywrens and Variegated Fairywrens. Although there was some water near the start of the walk we were soon to discover there was a lot further along. There was a huge flock of Little Black Cormorants and then we soon realised there were a lot more birds on the next section of the lake system. 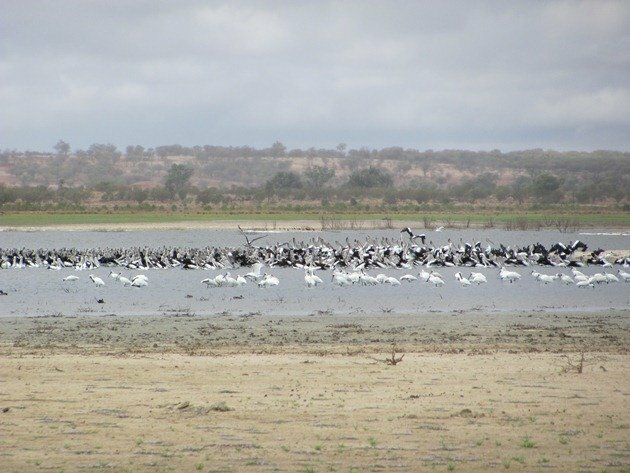 The heat of the day encouraged the Australian Pelicans to rise up into the thermals and we understand that they spend time between the lake systems at Currawinya and Lake Bindegolly National Parks. Apparently they breed to the south and return to feed at Lake Bindegolly. 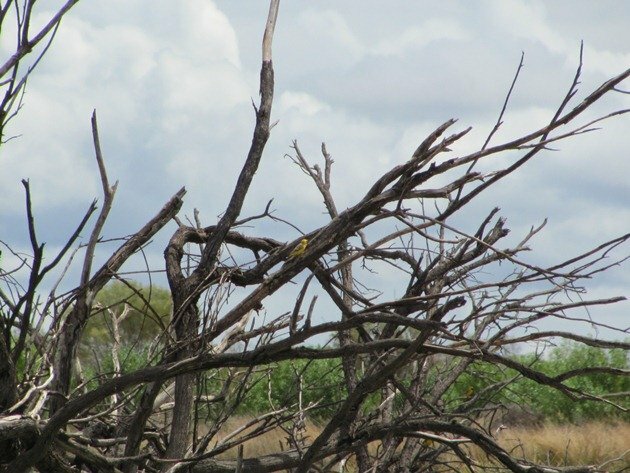 There was evidence of terns breeding at some earlier stage by the remaining carcasses in the bush. There were also Australian Pratincoles on the dry scrub around the middle of the day. 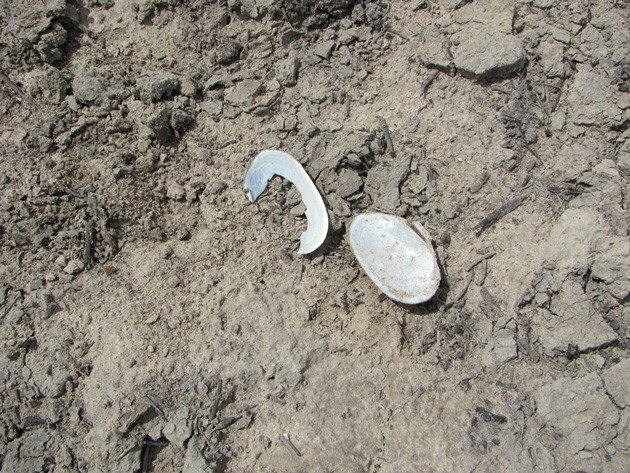 There was evidence of the mussels that would be a source of food for many species in the receding water line. We walked on to the main lake and discovered that there was a vast variety of birds. From a distance the Royal and Yellow-billed Spoonbills were fairly obvious, but we soon discovered that there were also Great Crested, Hoary-headed and Australian Grebes. The Silver Gulls, Caspian, Gull-billed and Whiskered Terns were further away and the variety of ducks was incredible. We saw more variety of ducks here than anywhere else in Queensland and it included Musk Duck, Freckled Duck, Pink-eared Duck, Blue-billed Duck and Hardhead. There was also flock of Sharp-tailed Sandpiper feasting along the edge of the water. 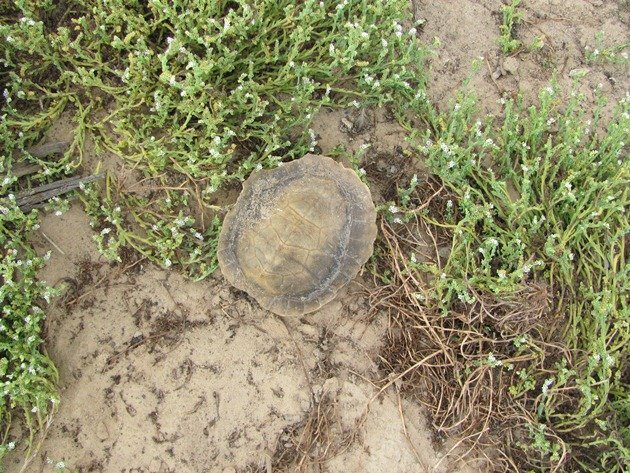 Evidence of other life during flood was a turtle shell and we were under no doubt that this environment was constantly changing throughout the year. 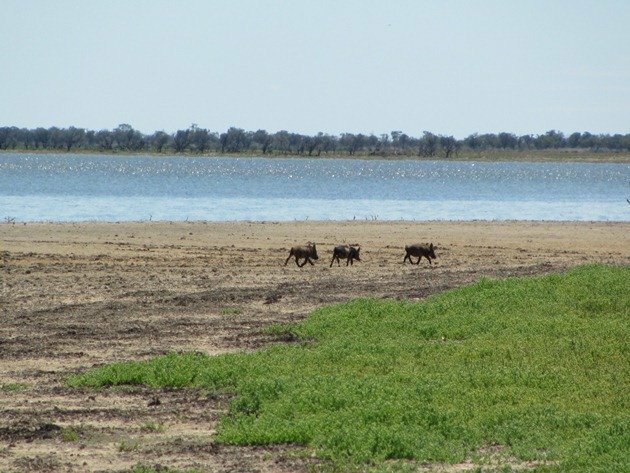 There was also evidence of the damage that feral pigs can do all along the trail and along the water’s edge and we soon came across a small group of them. 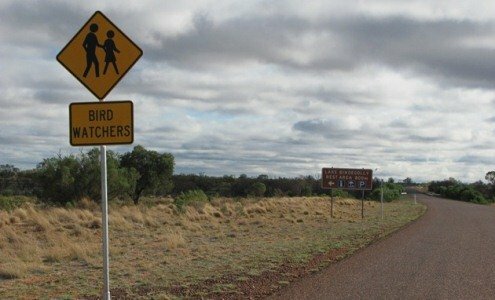 No doubt the National Parks are aware of the situation, but it is also hard to deal with feral animals in remote areas. We made a decision to head west to the next town, which was closer than Eulo, to camp to enable us to spend the best part of another day at this incredible lake system. Thargomindah is slightly larger than Eulo, but we were still the only people camping in town! It is famous for the Hydro Power Plant and water still comes up from the Artesian Basin at 82c (180f). They were the first town in Australia and third in the world (after New York and Paris) to produce Hydro-electric power for street lighting….not that there are a whole lot of streets! The next day the weather had completely changed when we returned to the lake system and was overcast and dull. We were undeterred! 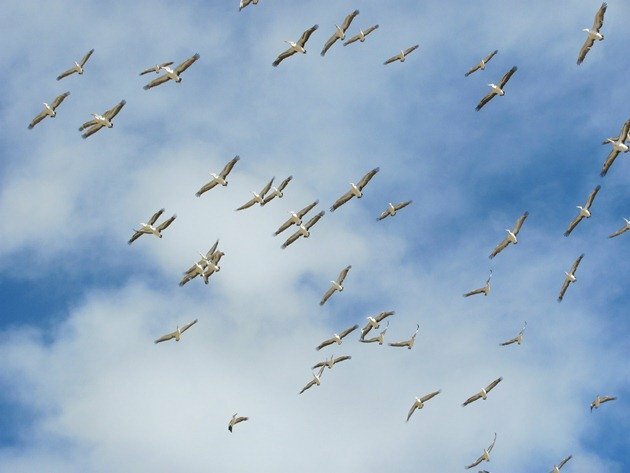 We knew we may get wet, but we also may experience different birds in a cooler environment. The clouds raced through, threatened, rained on us and we had a whole new experience at the same place! No sign of any Pratincoles on a cool day! The Spoonbills carried on feeding as we got wet and within minutes the storm passed by and the sky was blue once again. 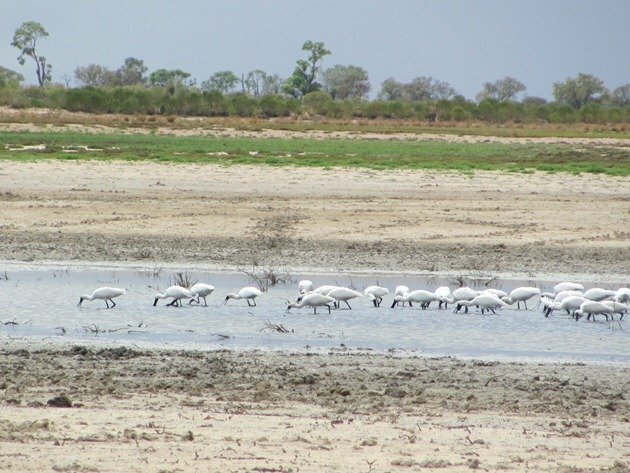 There were substantially more Royal Spoonbills than Yellow-billed Spoonbills. As we wandered slowly back along the track we discovered a pair of Horsfield’s Bronze Cuckoos amongst the Orange Chats and we had observed 65 species of birds at this location during our two 4 hour visits. 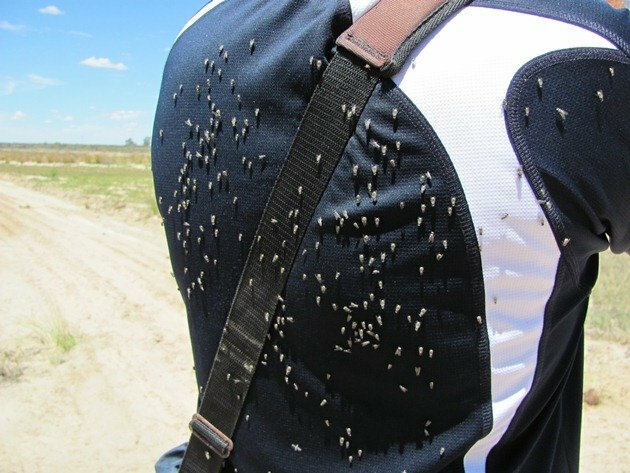 For those of you unaware of what the Outback has to offer I should bring to your attention the flies! They were not too bad, by Outback Australian standards, as they would quite happily sit on your back for hours on end and not get in between your binocular eye-pieces and your eyes too often! It is worth spending several days in this area if you also hope to see Bourke’s Parrot and the Hall’s Babbler, which were present near Eulo. Emus were prolific and careful consideration needs to be taken when driving on dusk or at night. We were rather surprised to observe Dollarbirds at Eulo, which seemed to be at the extreme of their range to the west. The dirt runway is worth checking early morning for Major Mitchell Cockatoos. Don’t be overly concerned if no-one knows about this National Park and go and enjoy it for yourselves! 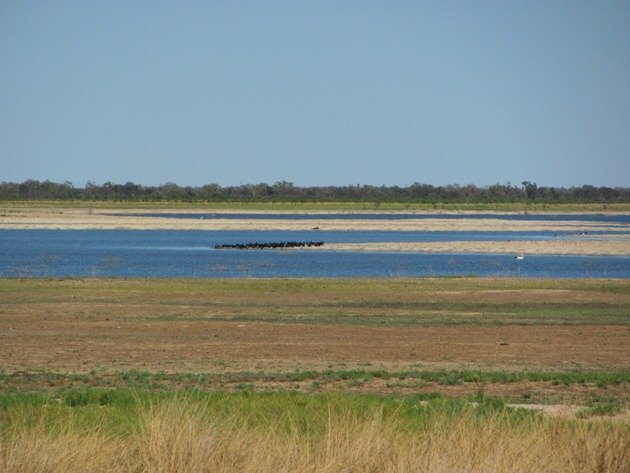 Be aware that there are no large supermarkets in these small towns and the water does have a sulphur odour due to the fact that it comes up from the Great Artesian Basin. That’s the first time I’ve seen a road sign for bird watchers! And I love the image of dozens of Australian Pelicans soaring overhead. This sounds like a magical place! Nice post, Clare! I birded as far west as Bowra Station near Cunnamulla in 2009. It was a very dry year, so I had no Budgerigars and few individuals in general. Nonetheless, I tallied around 90 species in just three days in that area. Lots of great memories, including Major Mitchell’s Cockatoos! Carlos-looks like you will need to return and wander a bit further west! Bowra Station was closed when we were there, so we will also have to return! What is the National Bird of Honduras?